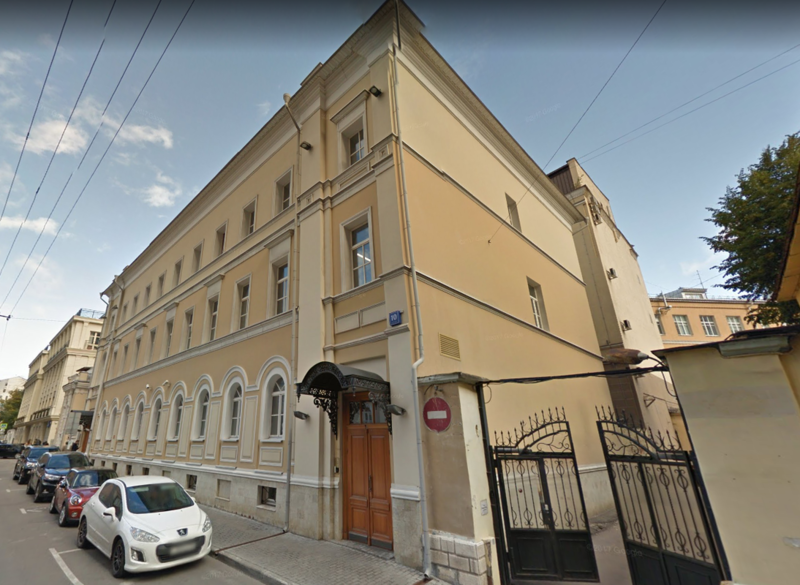 Out of all the pre-revolutionary British families in Moscow the Colley family is unique in that it is the only family that bears modern significance to St. Andrew's congregation. It is one of the very rare British families that completely assimilated in Russia and did not leave during the Revolution. And even though its last representative who bore the name Colley - James or Yakov Nikolaevich Colley - passed away in 2002, there are enough people at St. Andrew's who still remember him. It looks like it was William Colley (b. 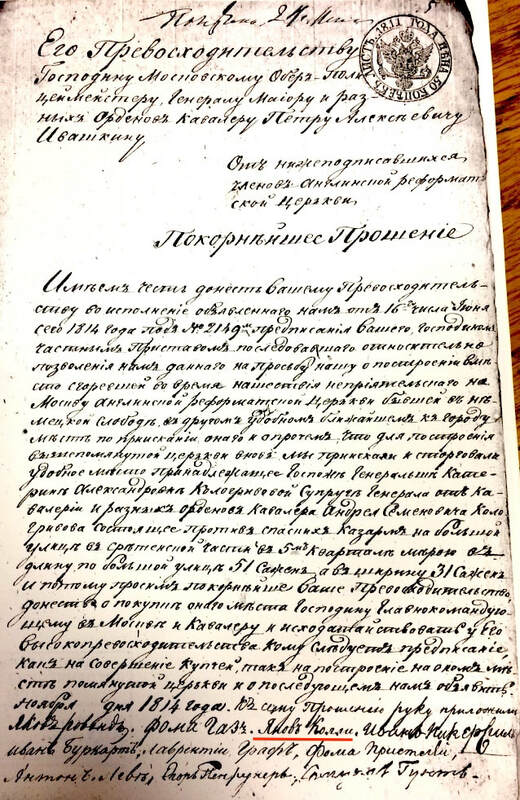 1737) who was the first Colley to come to Russia. I haven't managed to find any information about him, but considering that his son James (1771-1839) was born in St.Petersburg, that was probably where William Colley lived, which is hardly surprising - St.Petersburg was the capital and a port, both made it the most logical place to live and work. Both places were used as homes for many years to come by his children and grandchildren. 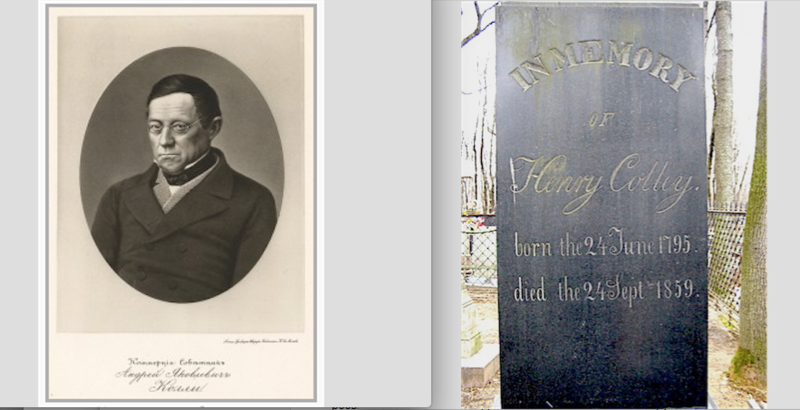 Henry Colley is buried at Vvedensky Cemetery in Moscow. Henry's two younger brothers Nicholas Mortimer (Nikolay Mortimerovich) Colley (1806-1878) and Charles (Karl Yakovlevich) Colley (1809-1859) seem to have had a somewhat similar life, though very different from that of their elder brother - Henry. Rather than becoming merchants, they chose to go to university and become surgeons! Even though neither of them had families, they led the way for the next generation Collies, many of whom chose academic professions. 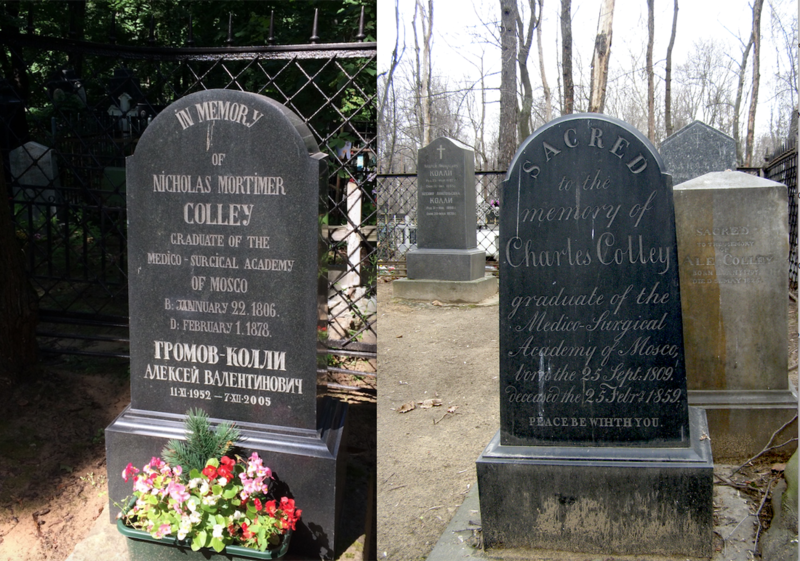 There is also another fact that brings these two brothers together: according to the Anglican Church documents, both of them were church wardens at the British Chapel in Moscow - Nicholas Mortimer in 1828 (this is about the time when the land with the building which was to become the British Chapel was bought in Bolshoy Chernyshevsky Lane, now Voznesensky Lane), and Charles in 1844. 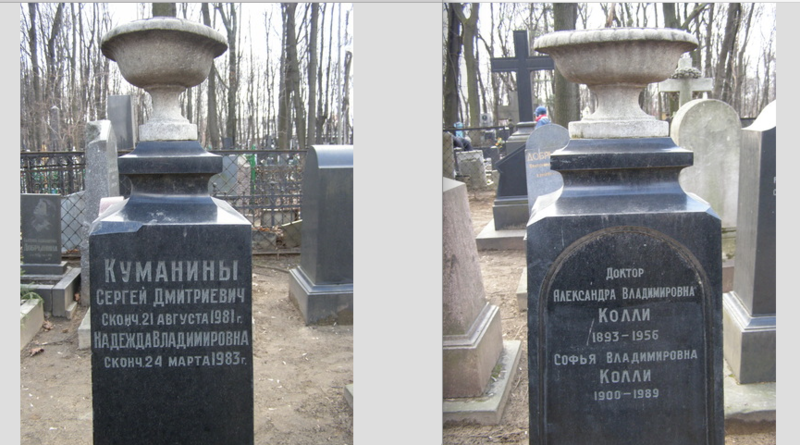 Both are buried at Vvedensky Cemetery in Moscow. I haven't managed to learn much more about the other children of James Colley - siblings of Henry, Nicholas Mortimer and Charles. The next generation of the Colleys are Henry's children. Henry Colley was married to Nataly (Natalia Christianovna) Reyngard and had 5 children: 4 boys and one girl. Three of his children married the children of a well-known sculptor of Italian origin - Santino Campioni. 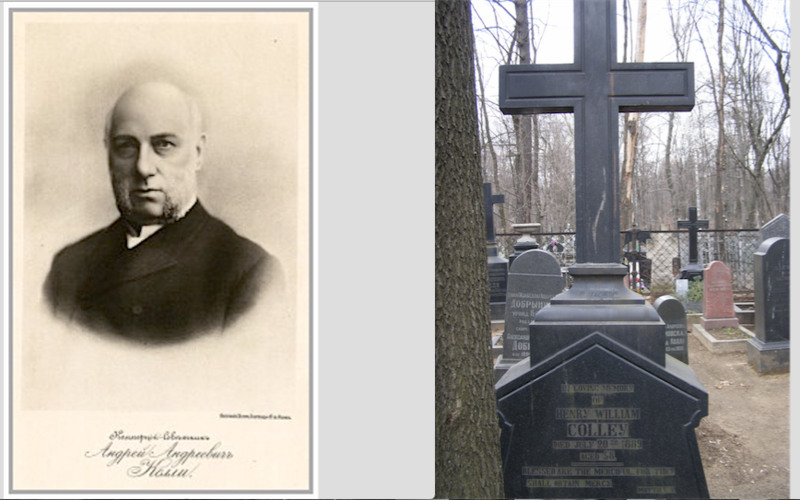 Alexander Julius (Alexander Andreevich) Colley (1840-1916) was a scientist. He graduated from Moscow University in 1860 and from 1876 to 1903 was a professor at Moscow University, as well as professor and Non-organic Chemistry chair at Emperor's Higher Technical School. According to the 1888 Moscow address book, he also taught at the Public Women's Courses. In 1869-70 he discovered the structure of glucose. In 1879 he was the first to synthesize disaccharides out of monosaccharides. 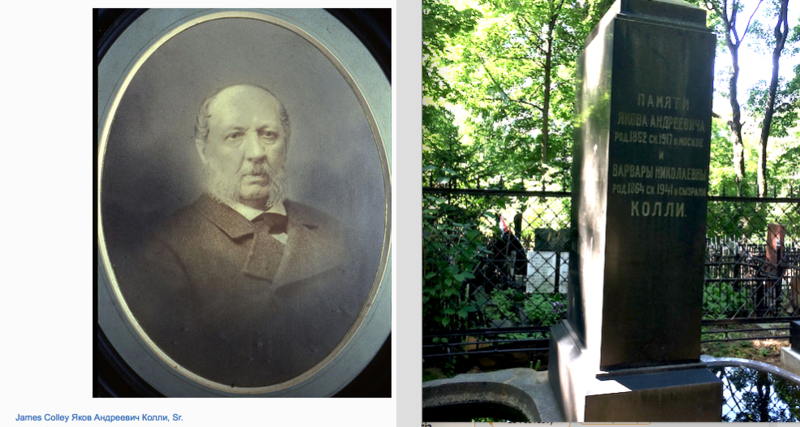 He was married 3 times, and one of his wives was Alexandra Campioni (1838-1865), daughter of the well-known sculptor. Vladimir Alexandrovich Colley had 4 daughters and no sons. 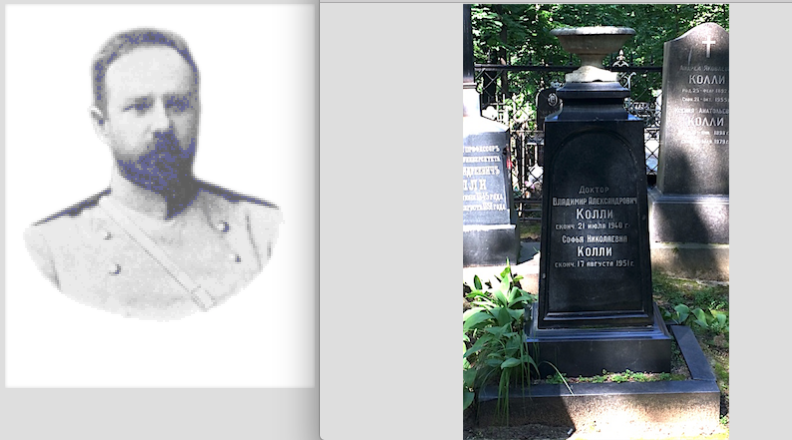 I didn't manage to find much about them, but from the tombstone we can see that at least one of them - Alexandra (1893-1956) - became a doctor, like her father. 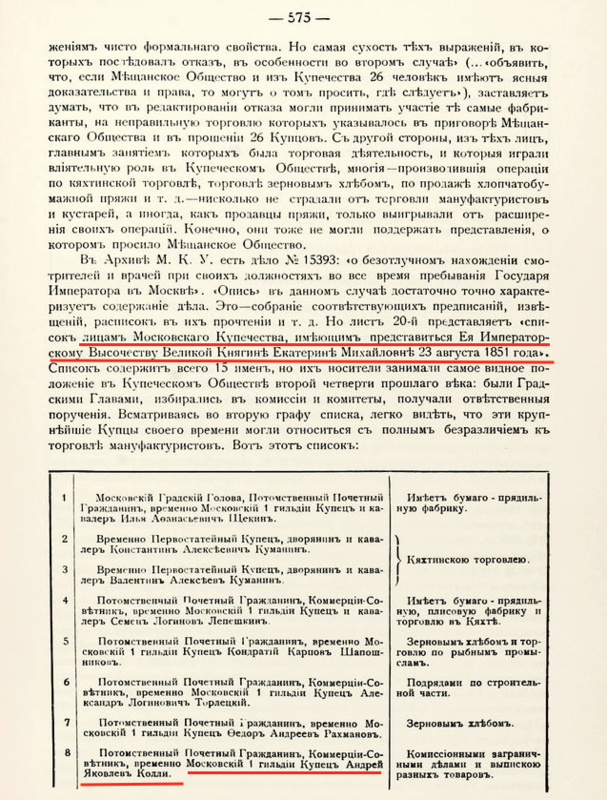 Another one, Ekaterina (b.1891) was mentioned in the 1913 Moscow address book as a teacher of the Yakimansky 5th Municipal Women's College. Just like his brother Alexander Julius, Robert (Robert Andreevich) Colley (1845-1891) was also a scientist. He was a physicist and professor at Kazan University, Moscow University and Petrovskaya Agricultural And Forestry Academy. 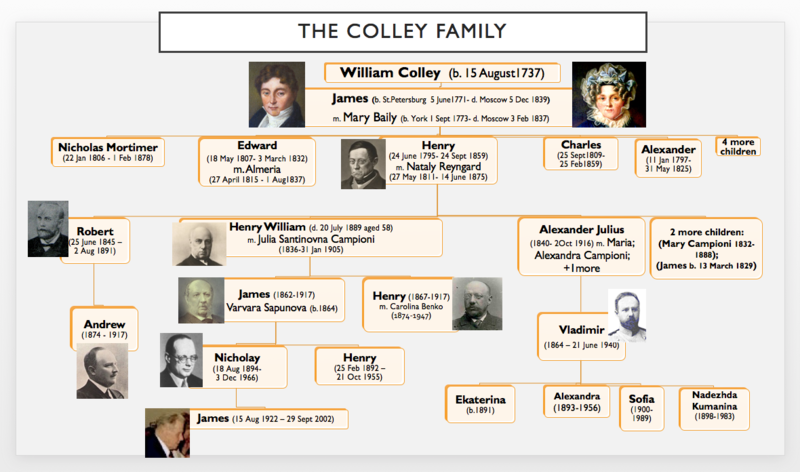 Robert Colley had only one son. 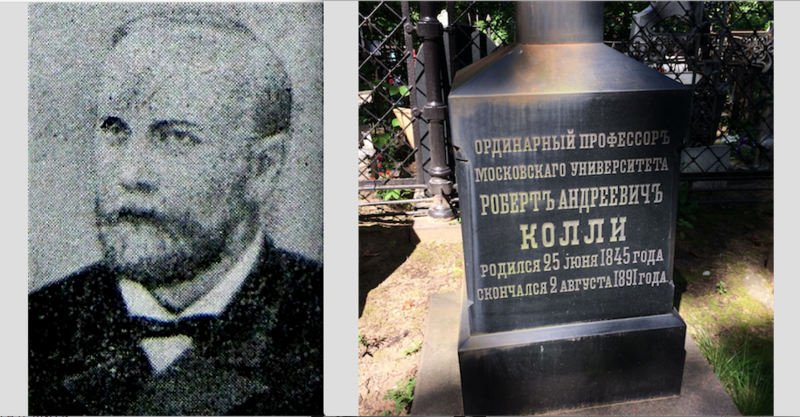 Following in his father's footsteps, Andrey (Andrey Robertovich) Colley (1874-1917/18) graduated from Moscow University as a physicist and taught there for several years. 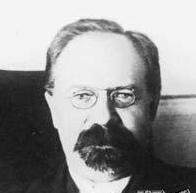 Then he was appointed professor at Warsaw University where he worked until 1915 when he had to be evacuated to Rostov together with the other professors of Warsaw University. 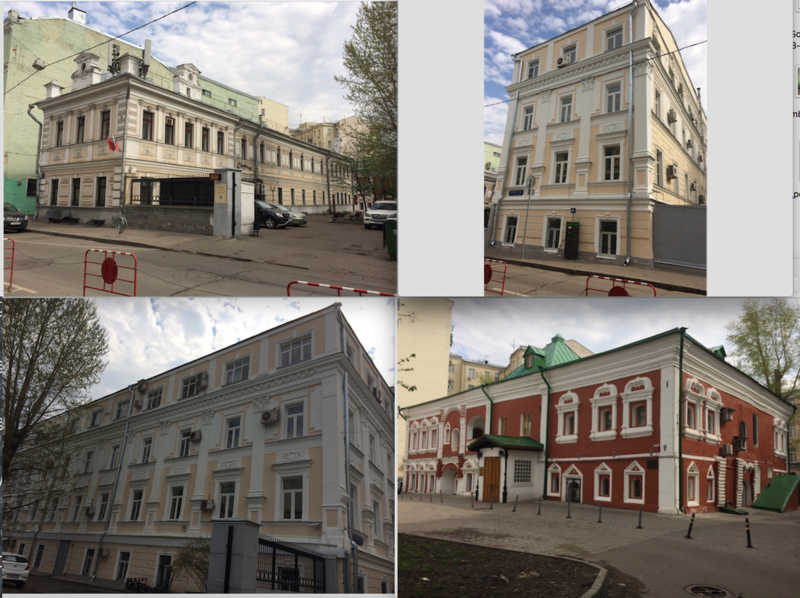 While in Rostov, he founded several physical laboratories of the future Rostov University. He was killed by the Red Army on 11/24 February 1918. Henry William (or Andrey Andreevich, as he was called in Russian) (1830-1889) was the only one of Henry's children who pursued the trade of a merchant. Like his father, he was a commercial advisor, hereditary honorary citizen, 1st Guild merchant, and he lived in the Colley house in Milutinsky Lane. Reading all the information about Henry William that can be found in the Moscow Address books, one can only wonder how he managed to find time and strength to do and to be everything that he did and was! Partner in the Trading Company and Bank "Achenbach & Colley-Junior"
Henry William was married to Julia Campioni (1836-1905), daughter of a well-known sculptor of Italian origin, and together they had 10 children. 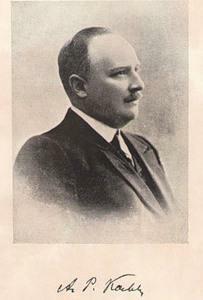 James (Yakov Andreevich) Colley (1862-1917) was the last merchant in the Colley family. He continued in the footsteps of his father: he was a hereditary honorary citizen and 1st Guild merchant. 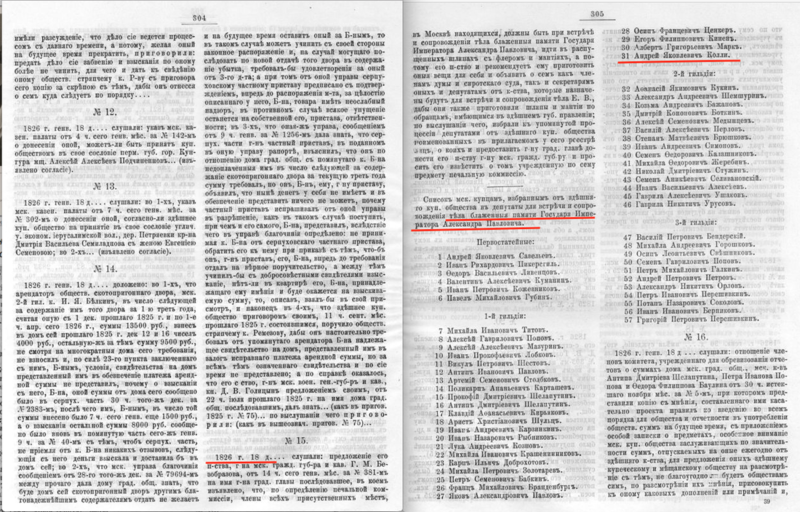 The 1905 Moscow Address book lists him as a Moscow City Duma (parliament) representative, merchant member of the Moscow Commercial Court, director of the Terek Mining Joint-Stock Company and owner of the Trading House "Colley Andrey". ​James Colley had 2 brothers: Vladimir and Henry of whom I know very little, and two sons: Nikolay and Andrey.